Rice is a staple in Nigeria, and the country consumes almost 7 million tonnes of it a year. That's a lot of rice, and in order to keep up with demand, the country has imported huge amounts of the grain. But it's not alone - according to the African Development Bank, about $35bn is spent on food imports annually across the continent. This is despite the fact that Africa is home to two-thirds of the world's most arable uncultivated land. 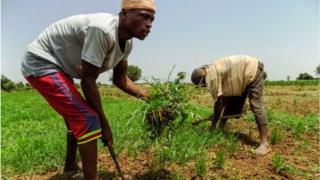 To boost food security, Nigeria has curbed imports and is now trying to encourage more rice production at home. But there's still a lot more work that needs to be done. For instance, the Central Bank of Nigeria set up a $130m initiative offering farmers who have at least 1 hectare of land loans at a 9% interest rate, which is below the benchmark interest rate of 14%. The World Bank has also funded several schemes in Nigeria to help boost agriculture, including centres offering equipment and machines at greatly subsidised hire prices to farmers. The efforts are starting to show results, and Nigeria is now producing 3.7 million tonnes of rice annually, according to the US Department of Agriculture, World Markets and Trade. "I started farming with only 1 hectare, and the average [yield] was 2-3 tonnes. When I integrated with [non-profit organisation] the International Forum for Agricultural Development (IFAD), I was able to increase my cultivation to 3 hectares, with an average of 8 tonnes," Aminu Ndakogi, a rice farmer in northern Nigeria told the BBC. "I'm planning to increase my cultivation to 5 hectares." The rural village of Kanko, in the state of Niger in central Nigeria, has also benefited from government and non-profit support. There are 100 rice farmers in the village, who are now able to produce 15 tonnes of rice from 200 hectares of land a year. They are aided by machines and an irrigation system paid for by IFAD, that enables the farmers to harvest three times a year, both in and out of season. But the village's rice millers say there is a bottleneck in processing the harvested rice. "The milling machine works well and we produce up to 50 bags of rice per day, except for days when there are power outages," rice miller Suwe Bah told the BBC. "We still can't mill enough bags brought in by farmers - we need funds to buy bigger and more advanced machines, so we can make more profit with less effort." Kanko still has another 600 hectares of land that could be farmed, but the village says it needs more technology, as it doesn't have the manpower to farm all of the land efficiently. "We're hoping the government comes through on its promise to support us with machines and agricultural imports like fertilisers and pesticides, so that we can be more productive than we are currently," said Kanko village leader Alhajikanko Haruna. "We have so much land lying fallow, but it's tedious to till the ground during planting, and harvest these enormous rice ploughs." Economic analyst Abiodun Adewunmi believes that local investment could also help boost the agriculture industry, but "a total overhaul" is needed to make farming into a an attractive proposition. The Nigerian government has long been concerned that its people are too focused on importing the things they want, and they are using their money to support foreign countries, instead of home-grown goods. In March, during a hearing of the Senate Committee on Agriculture, Nigeria's agriculture minister Audu Ogbeh called out Nigerians for using their mobile phones to order pizza in the UK and then have it flown into Nigeria. "I believe many Nigerians would want to invest in rice production, which indeed would help in achieving that self-sufficiency we're talking about," Mr Adewunmi told the BBC. Top of the agenda is North Korea's denuclearisation following the failed Trump-Kim meeting in Hanoi.